We begin our tour with the Gateway of India, the city's most famous landmark built in 1911. Originally an entry point for passengers arriving on P&O steamers from England, it is now remembered as the place where the British staged their final departure. The drive includes a look at a most remarkable railway station. 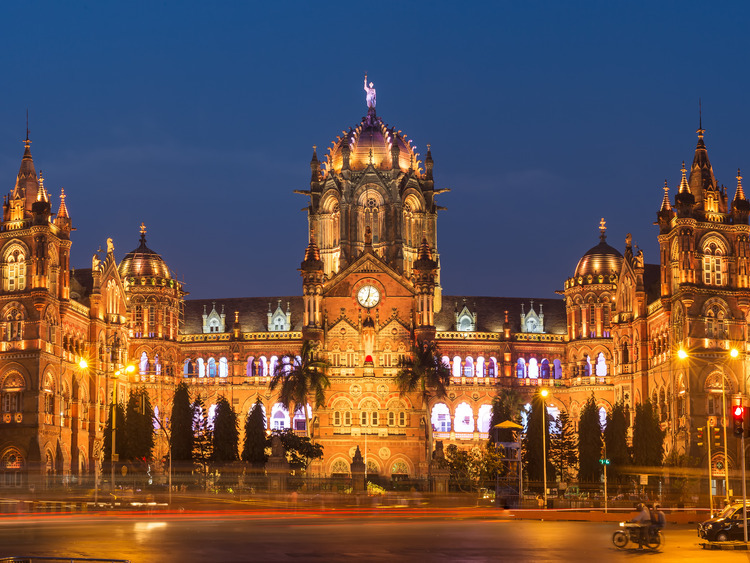 Inspired by St Pancras Station in London, the Victoria Terminus was built during Queen Victoria's Golden Jubilee year. It is an extraordinary conglomeration of domes, spires, Corinthian columns and minarets in a style that was described by journalist James Cameron as Victorian-Gothic-Saracenic-Italianate-Oriental-St Pancras-Baroque. It’s quite a sight! The first train in India left from this station in April 1853, and today an estimated half million commuters use the station every day. We continue along Marine Drive, Mumbai's seaside promenade, to the ISKCON TEMPLE, the International Society for Krishna Consciousness (ISKCON), famously known as the Hare Krishna movement. ISKCON_,_a monotheistic tradition within the Vedic or Hindu culture. After we will stop briefly for photos at the lovely Hanging Gardens. With an assortment of topiary hedges trimmed into whimsical animal shapes, the gardens offer a superb view of the city center in the distance. Your next photo stop is the famous dhobi ghat, where each morning laundry from all over Mumbai is brought to be soaped, soaked, boiled and thrashed, then returned to its rightful owner the next day, cleaned and pressed. Next, you will be dropped off at the Taj Mahal Hotel to enjoy 3½ hours of free time (lunch at your own expense) or a visit to the nearby Colaba Causeway Market. There is also shopping in the hotel itself. This tour is sold to guests with international flights departing after 1.00 am (of the day after). For guests that have booked "Cruise+ Costa Flight" dinner is included.